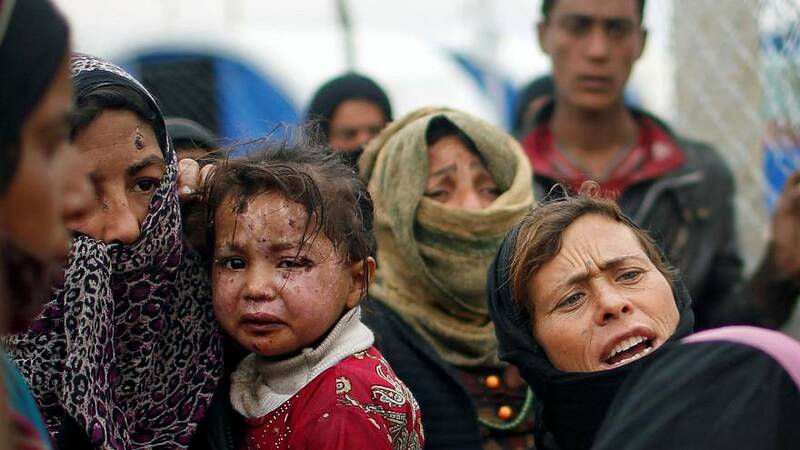 As the battle for Mosul enters its sixth month, thousands are still trying to flee Islamic State controlled areas in the west and reach the safety of government lines. An absolute disaster is in the offing threatening tens of thousands of lives. Since the beginning of the Mosul offensive in October with support from U.S. artillery, the number of displaced people from both sides of Mosul has reached 355,000, according to Iraq’s Immigration minister. More than half have poured out of western Mosul as fighting intensifies. “God knows they are criminals. All of them are criminals. Destruction. God knows. It’s overwhelming,” said a resident of Alyarmouk district. “We got out from the rubble. My house was gone and I was taken out of the rubble. There is destruction everywhere,” said another resident, Abdullah. Once displaced civilians arrive in the camps they find out there is no room. Waiting for new ones to be built by the UN refugee agency in order to cope with the overwhelming numbers of new arrivals, some refugees find a place in mosques, transformed into provisional camps. Despite all odds, some residents of liberated eastern Mosul have returned and started to rebuild their homes, even as gun and cannon fire rebound of freshly-laid walls. “I am glad we are liberated. Our house has been demolished. That’s the price we had to pay,” said Samira. “Of course the fighting continues nearby but where can we go? There is a shortage of houses. We have to rebuild our houses and for the moment we build just temporary homes,” said a man rebuilding while the sound of fighting could be heard just blocks away. Experts expect the heavy fighting to last several more weeks, but Mosul’s homebuilders are providing a tiny sign of recovery, and proof ISIL did not obliterate the spirit of the city’s people.